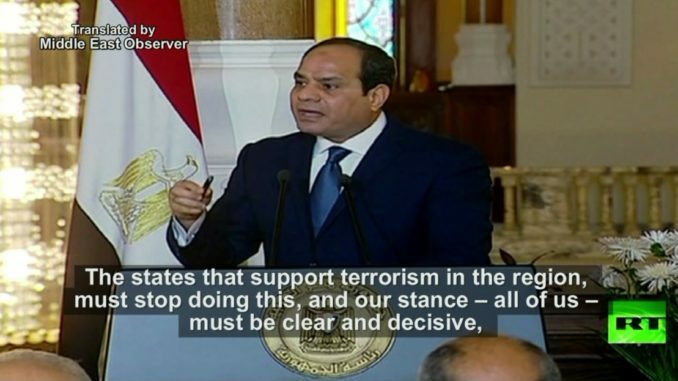 Egypt’s President Abdel Fattah al-Sisi outlines his country’s five-point policy on Syria, and says that the states supporting terrorism in Syria must stop. So we in Egypt, our stance is clear, and we have five points which we affirm, and they won’t differ too much regarding Libya as well: we talk about the unity of Syrian territory; we talk about a political resolution to resolve this crisis; we talk about that we can no longer leave the Syrian people after this – after reaching a resolution – as captives of the terrorist armed groups; and the reconstruction of Syria. This state has been destroyed in the last six years. If we do not carry out a huge effort to rebuild it once again, I believe we would not have resolved the issue. One way or another, this issue is (also) present in Libya – one way or another. The states that support terrorism in the region, must stop doing this, and our stance – all of us – must be clear and decisive, and that we have one face before the world when we talk about these issues.